Why Might Businesses Be Interested in Contributing to Sanitation Efforts? Sanitation is quickly gaining prominence as one of the most important development challenges of the 21st century. This status is well-deserved: 2.5 billion people in the world do not have access to adequate sanitation. Inadequate sanitation is known to cause chronic health and nutrition problems, prevent children (especially girls) from receiving education, and contribute to water quality/access challenges and ecological degradation. Children living in households with no toilet are twice as likely to get diarrhea as those with a toilet. In the Global South, around 90% of sewage is discharged untreated into rivers, polluting freshwater sources used by communities, agriculture, and industry. What is the business case for corporate action on sanitation? The business case with respect to water is somewhat obvious. Industries around the globe rely on water as a key input into their production processes and therefore have a strong interest in ensuring water supplies are maintained over the long-term. Further, many businesses use quite a bit of water and create wastewater pollution, often meaning they must manage adverse impacts on water resources if they are to maintain their social and legal license to operate in a given area. With sanitation, the linkages to business practices are less obvious. First, it’s not clear whether business practices routinely contribute to or are somehow complicit in the sanitation crisis. Second, most companies do not directly rely on sanitation as a key input into their production processes or sell goods or services that are directly related to sanitation practices. Managing risks around water pollution: The practice of open defecation often leads to the contamination of rivers, lakes, and streams with human faecal matter, leading to a wide range of human health concerns. From a business perspective, this could lead to increased operational costs in the pre-treatment of water as it comes into the factory and at worst render potential water supplies unusable. Improving employee productivity and morale: A lack of sanitation coverage leads to great human health concerns and also often discourages children (and especially girls) from attending schools where toilets are not provided. From a business perspective, this could lead to a loss of employee productivity due to worker illness or a need to care for sick children. A lack of education may also mean that a given community is less equipped for employment over the long-term. 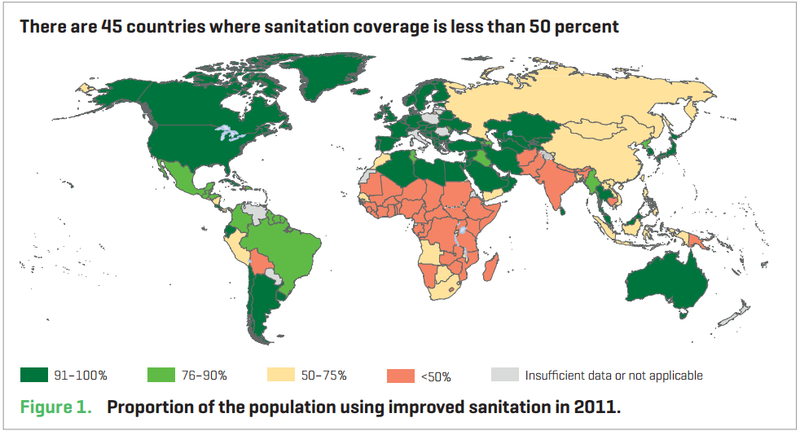 Driving economic development: Several studies have shown that a lack of sanitation coverage is actually a great contributor to economic stagnation in many parts of the world. Further, UN-Water estimates that for every dollar invested in sanitation, there is a return of $9.1 USD. 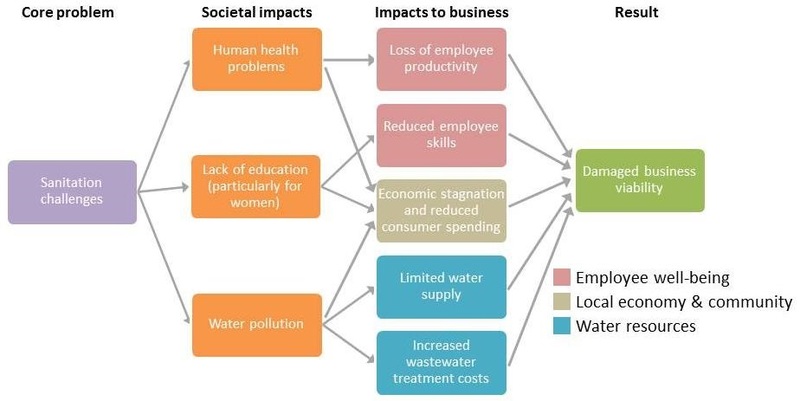 This indicates that adequate sanitation can be a critical factor in creating an economic environment in which sufficient infrastructure necessary for business is developed and maintained, consumers are more willing and able to spend money on goods and services, and businesses are ultimately better positioned to thrive. Do business operations have the potential to create adverse impacts related to the human right to sanitation specifically? How? What efforts should companies take to support and ensure employee access to appropriate sanitation services? What are the responsibility boundaries regarding employee access to water and sanitation in the workplace and in their homes? Might a company have a business interest in supporting the fulfillment of sanitation services specifically. If so, what are these key motivations and drivers? If you have any thoughts or responses to these questions, please let me know! You can reach me at pschulte@pacinst.org.